Enjoy completely renovated lake house located on quiet street that dead ends into Lake Erie! 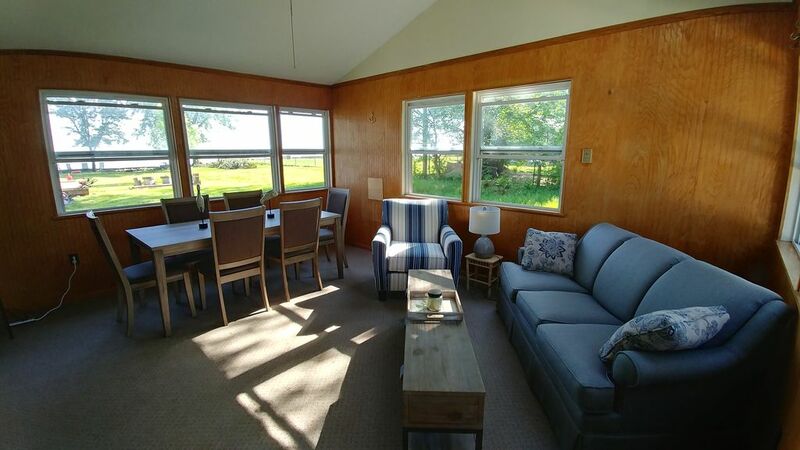 NEW FOR 2019, sliding patio doors off the sun room, leading to a new deck, creating great outdoor living space while enjoying views of the lake! Home features sun room, living room, comfy beds, eat in kitchen with new appliances, granite counter tops, two full baths, fire-pit and gas grill. MANY area attractions close by including Jet Express and Camp Perry. Don't miss this opportunity, book now!! As an VRBO customer myself I recognize what's important to guest. My family loves to travel and we've stayed in rentals from Sioux Falls, SD to the Caribbean Island of Grand Cayman, where we just celebrated our son's 21st birthday. I love to cook, #1 on my bucket list is to cook with Ina Garten, my HERO! My husband and I love to host dinner parties especially when the weather cooperates! I love being outside when it involves working in the yard tending to my perennials and water plants in the pond my husband created. Also, I can't forget to mention I love drinking wine! I hope you enjoy your stay! 2 refrigerator's, one in the kitchen & one in the sun room. The eat in kitchen seat 4, we also have a dinning table and chairs in the sun room that seats 6. 2 TV's, one in living room & one in sun room. We absolutely enjoyed our recent stay. The house is well appointed with many thoughtful touches (toiletries, cooking basics, comfortable beds, nice quality towels, games, etc.). We had everything necessary for cooking in the kitchen. The location is one lot from the lake, but you have a fantastic view of the water from the backroom (great space to hang out and play games or do a puzzle). The neighborhood was quiet and a short drive to the area sites. I would definitely stay here again and recommend this to others. Thank you for the amazing review! Everything you mentioned is what we absolutely love about our lake house!! We'd love to host you and your guests again in the future!! Beautiful remodel, fully equiped with niceties, and a useful outdoor space with views of Lake Erie. Lori thoughtfully remodeled (and perhaps added the large bonus family room), with renters in mind. The kitchen, baths, and bedrooms are conveniently stocked and decorated with everything you will need. Outdoor gas grill, picnic table and storage shed make the outdoor space very usable. Lori seems very accessible if needed. We did have a few minor house issues which Lori will fix and overall we really enjoyed our stay and the location. Note that while you have a lake view you cannot really access the lake except to walk to the end of the street (only 200 feet) and stand on large concrete blocks/rocks. Overall however, a real plus value! Glad to hear your family enjoyed themselves at the lake! Thank you for your good communication! Awesome views of the lake and the islands from the back porch. Plenty of room in this house. Good size 3 bedroom. Friendly neighbors and good location to bike or walk to the ferry launch and in town just across the drawbridge. Glad your family enjoyed their time at the lake! Thank you for nice review! This is a lovely place to stay - clean, updated accommodations! The kitchen is perfectly appointed with everything you might need. While visiting, we enjoyed the Portage River Paddling company nearby for kayaking and paddle boarding, as well as trips to Perry Beach, Marblehead, and Lakeside. Thank you for the great review! I'm glad your family had a great time! Really clean and quiet! very roomy, met our needs! would stay again! Thank you for the nice review! I would love for you to stay again! Thank you for taking such good care of my lake home!